LG V20 price: how much does it cost? LG announced its V20 smartphone a month ago and now we finally know when the phone is arriving in the United States. Unfortunately, pricing and availability hasn't been announced for the UK or Australia just yet,. We'll update this story with more details as we learn more. According to a T-Mobile press release, the LG V20 will hit stores on October 28. And for a limited time, the carrier will be bundling a pair of BeoPlay H3 headphones (worth $149, or according to T-Mobile, 33 pumpkin spice lattes) for free. T-Mobile didn't specify how long this promotion would last. You can buy the LG V20 from T-Mobile here when it's available. Unfortunately, T-Mobile didn't provide any pricing information about the V20. A T-Mobile spokesperson speaking with TechRadar said the carrier will release pricing information closer to launch. If you're on AT&T, the LG V20 pricing has been announced but not a launch date, though we expect to see it available near the end of October, like T-Mobile. Thankfully, you can make payments on the phone at $27.67 per month for 30 months or $34.59 per month for 24 months. If you do the math, both plans indicate that the LG V20 will cost around $830 unlocked, though no full retail price was provided. Preorders for the phone start October 7, and you can reserve yours on AT&T's website. While $830 is undoubtedly a lot of money, the pricing of the LG V20 falls in line with other big-screened phones like the Apple iPhone 7 Plus and Samsung Galaxy Note 7. Whether you're willing to pay $800 for this phone and its 5.7-inch QHD display, Snapdragon 820 processor and its early Android 7.0 Nougat support is another story. Verizon and Sprint announced that they, too, will carry the LG V20, though Verizon hasn't released any details about availability yet. Sprint announced that the LG V20 will be available on October 28. Pre-orders for Sprint will begin one week ahead of its release on October 21. And for a limited time, Sprint will let you trade your old phone for up to $200 worth of credit to go towards buying the V20. Like T-Mobile, Sprint will also bundle a free pair of Bang & Olufsen BeoPlay H3 earphones for a limited time. One perk of buying the LG V20 as soon as possible - when it becomes available in the US, that is - is that LG is giving away a pair of B&O Play H3 Lightweight Earphones with a purchase of the V20. The deal is only for a limited time, but if you act quickly, you may just grab a set. In other news, the LG V20 won't be coming to the UK and many other regions around the globe. At least, that's what LG told TechRadar in a statement regarding the Android Nougat-flavored phone's initial launch plan. If you've been excited about LG's latest popping up in your region, well, you might be disappointed with this announcement. According to LG, the two-screened phone will only be launching "...in North America, Asia the Middle East, and Africa." 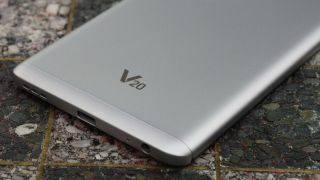 Most phones debut in a few select countries, then see a wider release a few weeks or months afterward, but the chances of the V20 spreading around the globe are currently up in the air. After the generally positive reception of the LG V10, we had high hopes that LG would give its successor the global treatment, especially given that its clever dual camera setup - one of its marquee features - has been adopted by the iPhone 7 Plus. We'll be keeping an ear to the ground for the V20's launch status moving forward, but if you were hoping to snag this phone in your region, LG's plans seem to have dashed hopes. Be sure to check out our LG V20 hands-on review before buying.